2019 TAILGATE N’ TALLBOYS FESTIVAL! All Concerts to Be Held on the Peoria Illinois Riverfront! PEORIA, IL (November 6, 2018) – Inked Entertainment, LLC has announced the first 22 artists that are set to perform for the 2019 Tailgate N’ Tallboys Music Festival. Tailgate N’ Tallboys will be held on the riverfront in downtown Peoria for the third year. In 2019, the series will span 7 dates. June 13, 14, 15 and 16 will be the first set of concerts and July 19 and 20 will follow. There will be a final concert on Saturday, September 14th. In addition to the main stage performances, there will be numerous local and regional performers on the Crusens Side Stage, as well as various festival activities throughout the series. CLICK HERE to purchase tickets! o Support (in alphabetical order): Ashley McBryde, Carter Winter, Michael Ray, Mitchell Tenpenny, Muscadine Bloodline, Sweet Tea Trio, Walker McGuire. June 13, 2019 will be the Kickoff Party to the music series. Artists announcements for the Kickoff Party will be coming out at a later date. All Ticket holders (including multi day passes and single day passes) will receive free entry into the Kickoff Party. Inked Entertainment has also been working with the Peoria Area Convention and Visitors Bureau to set up discounted hotel rooms at many area hotels for concert goers. 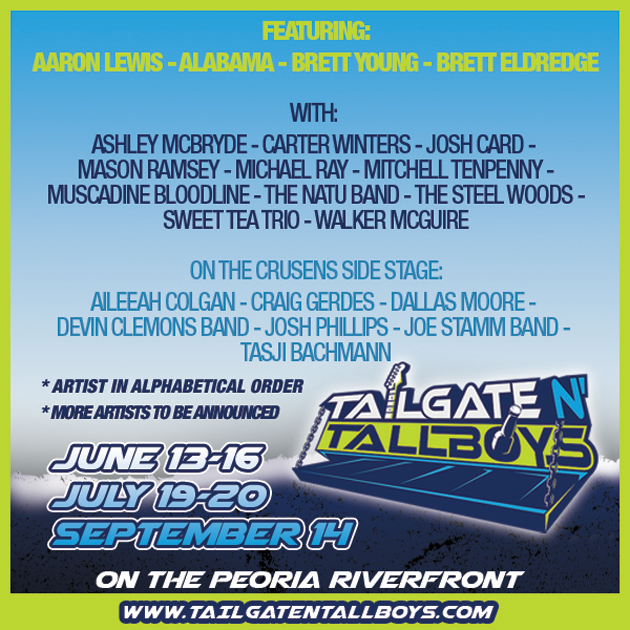 A link to the reservation system will be located on the festival website: www.TailgateNtallboys.com (under the travel section) when that becomes available. Sign-up for the Tailgate N’ Tallboys Newsletter/Eblast list to receive updates on that. In addition to the hotel rooms, Tailgate N’ Tallboys has just secured a new camping location for the 2019 June weekend, at the Heart of Illinois Fairgrounds. Full hookup and primitive spots for campers and tents will be available. This will include shuttle service to and from the festival throughout the day. Details are still being worked out. Once available, camping passes will be available at www.TailgateNtallboys.com. Sign-up for the Tailgate N’ Tallboys Newsletter/Eblast list to receive updates on that. There will be multiple new amenities and logistical changes in 2019. The stage will now be south facing with the stage facing bridge on what was the backend of Festival Park (venue). This allows for more room for those with chairs and allows for the growing attendance that the festival has experienced over the past few years. The VIP section will have a full-service bar, air-conditioned restrooms and more amenities added later. The new NASH Pass will be available for all three weekends. Included in this pass is secure gated parking, a pre-show reception at Cumulus Studios (with drinks and food), weekend VIP Passes, entry through a special VIP entrance that is close to parking and leads right into the VIP section. The 6 Pack Pass will once again be available for the festival. This allows purchaser entry into all dates of the series for a deeply discounted price. 6 Pack Passes, June Weekend Passes, July Weekend Passes, September Single Day Passes go on sale November 6, 2018 at 10AM and will be available at discounted prices until November 27, 2018 at 10AM, at which time prices will increase. Single Day tickets will become available in early Spring, when more artists are added to the schedules. There are many more announcements in the works, so keep up with the latest by following Tailgate N’ Tallboys on Facebook, Instagram and Twitter, or by visiting the official website at www.TailgateNtallboys.com. Tailgate N’ Tallboys is Central Illinois #1 Country Music Festival. The Music Series is designed with the true Midwestern summer concert goer in mind. Boasting top country acts to span over the summer months all at one low cost ticket price. Our 6 Pack Pass allows entry to 6 concerts for practically the cost of one concert. This allows our Midwestern country music lovers the ability to attend one or all six shows on the calendar to keep the party going all summer long.